Fourteen years, deaths, illnesses, corruption and kickbacks! Who knew a history of the construction of the Brooklyn Bridge could be so interesting? It takes a family (and a lot of immigrants) to build the Brooklyn Bridge in The Bridge: How the Roeblings Connected Brooklyn to New York. The story begins when John Augustus and his son Washington Roebling are trapped by ice in a ferry from Brooklyn to New York City. Washington was still a high school student but he figured out how to free the ferry using materials on board. Later, Washington’s life is shown from college to war to marriage to a family of his own. Once the bridge construction begins, it is interesting how many new techniques are used. In the nineteenth century, America was inventive and proud of their new technologies. At times, politics and corruption appeared. However, the bridge continued to be built though behind schedule and over budget. Government hasn’t changed much in the past 130 years. This is a great adventure story. Sure everyone knows that the bridge was built. Few know the technology used to build it. I doubt that the loss of life and expense in 2018 dollars would allow it to be built today. It is a fascinating look at the hubris of early America, where anything seemed possible. It is also a unparalleled love story between Washington and his wife, Emily. Emily was willing to fight gender prejudice and high-powered politicians to ensure her husband’s dream reached fruition. Surprisingly, this is the first graphic novel to tackle the Brooklyn Bridge’s story. I think the beautiful art and color work add to the story. With only words, it would be difficult to imagine the toughness needed by the men to risk death and illness to dig the caissons that support the bridge. The partially completed scenes in The Bridge were particularly instructive. It didn’t take long to start to see its familiar shape. 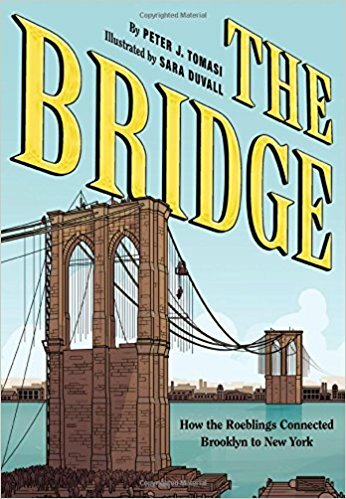 The Bridge: How the Roeblings Connected Brooklyn to New York is highly recommended for both graphic novel readers, students writing papers about the bridge’s construction and to anyone who wants a good read. 4 stars! Thanks to the publisher, Abrams Comic Arts, and NetGalley for an advanced copy.